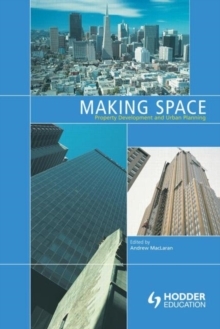 "Making Space" studies the built environment by examining the private-sector forces responsible for its development and the urban planning systems put in place to influence, guide and manipulate its outcomes. The first part provides a theoretical context for understanding the functions of the property development sector and the state's interventions through the medium of urban planning. It analyses the relationship between planning and development, and focuses on the increasingly widespread adoption of more pro-active entrepreneurial planning agendas as a response to a growing disenchantment with traditional regulatory approaches. The second part comprises case studies (drawn from Australia, New Zealand, the USA, the United Kingdom and Ireland) which investigate the ways in which urban planning in different socio-political contexts has influenced the outcomes of the property development process as well as the manner in which such planning systems have changed in order to enhance their influence.